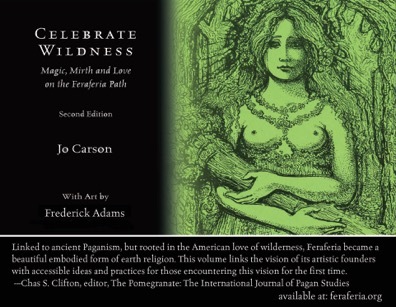 I was asked by my dear friend M. Macha Nightmare to blog about Jo Carson’s new book, Celebrate Wildness. What I did not know when I agreed to participate was just how beautiful the book was in real life. I read a pdf version which although quite poetic, did not do justice to the wealth of art within this magnificent large format book. I would suggest that, although the book describes a long standing spiritual tradition, it resembles a coffee table art book most of all. Fred Adams was, by most accounts, an incredible artist and visionary. He and Lady Svetlana crafted liturgy and practices that are deep, mysterious, and filled with such beauty it brought tears to my eyes. Jo Carson has done an incredible job of capturing the depth and beauty in her breathtaking book. A fondness for the wild places is a trait I share with Adams. And it is his love for the wild that led him to envision and then create a culture, a way of life, and a spiritual tradition dedicated to the wilderness and the wildness that lives there. He recognized that wildness that continues to live inside of us as humans and built his church around bringing it back into our lives and our consciousness. I am especially in awe of the raising of the Maiden as the cure to our collective patriarchal madness. Kore becomes more than a fair maiden who becomes swept away; she becomes the empowering life principle within us all to counter the toxic influences of our Western culture. Hail Kore! She is the cleansing and refreshing water that soothes our parched throats, washes away the ashes, and heals our burning flesh. She is the healing balm and the tsunami of change we have all been aching for in our hearts. What impresses me further is the promotion of henges as the key tool in reconnecting our modern minds with the ancient soul work of our ancestors. And what is a henge if not an earth-based honoring of the celestial vault. Feraferia goads us further to add in local flavor by following the lines of this earth sigil and welcoming the local Fae we find along those lines into our rites. I especially love the marking of significant dates and local celebrations into the henge itself. “Silently slumbering her limbs curl around the cold world. The most touching of the Feraferian practices is the annual ritual of repose. Held during the time of the American Thanksgiving holiday, the Repose Sabbath is rich in dark imagery, invokes cosmic powers, and celebrates the sleeping goddess. Like all Feraferian rituals, it is filled with music, beauty, and poetry. And in the manner of things that make you go hmmm…. Feraferia, like the Order of the Elemental Mysteries, treats the elements as two opposing pairs — Air/Earth and Fire/Water. Unlike the Order which uses this placement only in our astral temple, Feraferia uses this placement in their quarter cast circle. I found the attributions quite satisfying with Water/Winter in the North and Earth/Autumn in West. Feraferia offers a unique vision that is simultaneously anchored within ancient practices. Jo Carson has brought to the world a tantalizing glimpse of her tradition’s depth and beauty. I look forward to her next effort in this series. Hail Kore!